We will not be hosting a Handyman Challenge this year. Keep an eye out for next year and let us know if you have any ideas or projects! Thank you so much to everyone who supported us by buying a ticket, even if you did not win a shed you helped to support us and our programming! There are also still sheds and Playhouses available for purchase on our property. We will post prices and pictures later on! 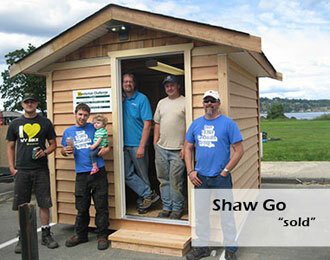 Want to win a Playhouse, Shed or Greenhouse? 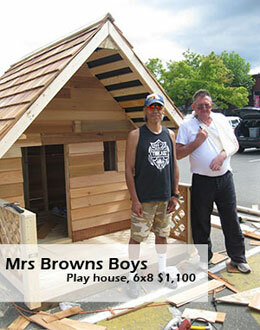 Raffle tickets are available for the Playhouse, the Greenhouse Shed combo and for the 8x8 custom built Windsor shed. Tickets are $10.00 each and are available at our office, Royal Le page office and if you keep your eye out, we are at grocery stores, farmers markets and at the CR Salmon Fest with tickets on hand! Please see the photos below for prizes. 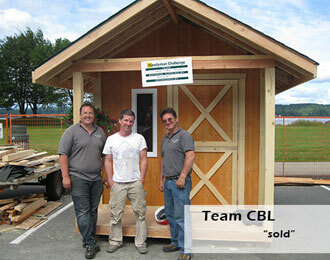 Thank you to all the teams who came out and built sheds and playhouses this year! In First place taking home the gold hammer is Don't Poke the Shawmen with their handcrafted kids playhouse, copmleate with swirly slide, parents mirco storage and a space for a large sandbox underneath! 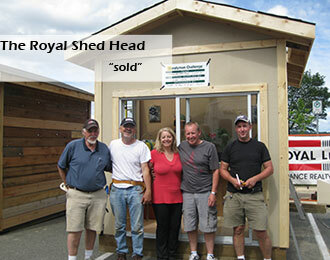 In Second place with the Silver Hammer are The Royal Shed Heads, with their beautiful & creative Greenhouse Shed Combo. Taking home the coveted Rusty Hammer we have Ouch my thumb with their 8x10 simple design shed complete with window and door! Thank you so much again to all the amazing team members and their familys for your time and hardowrk spent on building these beautiful structures! What a success this years event was! So many Beautiful sheds! Thank you so much to all of our wonderful and amazing sponsors, donors, volunteers and of course, to the builders! Without whom the sheds would not exist! The live auction went fantastically! 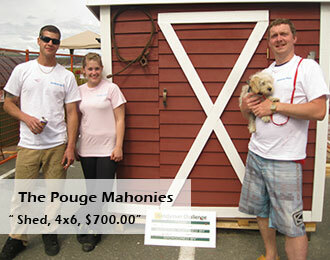 We have sold all our sheds and made just over $15,000! Thank you to everyone who participated! 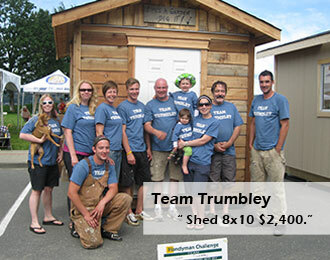 Please take a look into our gallery to see the sheds that were built this year and the fantastic teams that built them!